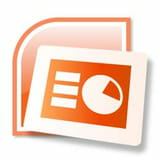 The Outline tab: is the location where you write the content (shows how text used in your slides are to be displayed). The Slides tab: is the appropriate location to view the presentation slides as thumbnails while editing them. Thumbnails allows easy navigation for the presentation and visualization effects when changing the design. You can also rearrange, add or delete slides easily in this mode. 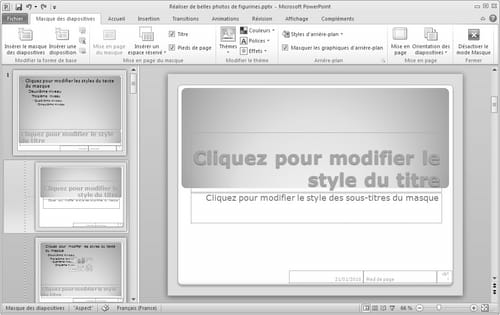 The main workspace, located in the upper right corner of the PowerPoint window, displays the your active slide. You can add text and insert images, group/ungroup and manipulate as many as objects as you want: charts, SmartArt graphics, charts, drawing objects, the text boxes, movies, sounds, hyperlinks and animations. The Comments Pane: below the Slide pane is used to enter comments about the slide. You can print the comments or refer to them during your presentation. The Slide Sorter mode displays the slides as thumbnails. This mode allows you to easily sort and organize the sequence of your slides while creating your presentation. Besides the Comment panes below the Slide pane, you can switch to Notes Page view and enter the comments in full screen mode. Basically its the fullscreen mode. The Slide Master, Handout Master and Notes Master notes modes. They represent the main slides that stores information about the presentation, including the background, color, fonts, effects, as well as the sizes and positions of objexts. The main advantage of working in a Mask mode is that you can change the universal style of each slide, notes page or document associated with your presentation. Published by deri58. Latest update on October 23, 2012 at 06:53 AM by deri58. 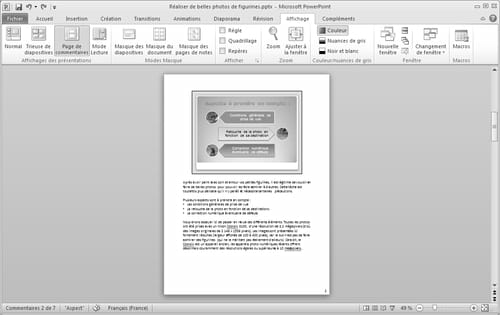 This document, titled "PowerPoint - The different view modes," is available under the Creative Commons license. Any copy, reuse, or modification of the content should be sufficiently credited to CCM (https://ccm.net/). How to make a good use of a PowerPoint presentation?